The Southern Pacific Stockton Flyer was running late. It had been delayed at Port Costa and Engineer James McGuire was pushing his giant, powerful locomotive faster than the normal 60 miles per hour in order to make up the lost time. The Southern Pacific took pride in being on-schedule. James McGuire felt confident since the only other train on the tracks was a good 30 minutes ahead. The night of December 20, 1902 was cold and dark but clear. Perfect for a good, fast run into the inky blackness of the vast San Joaquin Valley. The Owl Limited had left Oakland half an hour before the Stockton Flyer. The passenger train was modern, comfortable and full of happy travelers bound for Christmas reunions. Introduced in 1898 she made the scheduled run to Los Angeles, some 500 miles away, in 15 hours. The Owl Limited catered to businessmen, shoppers and students from the University of California at Berkeley. This evening the train was also host to an unusual group of passengers, a colorful Chinese wedding party bound for Fresno. Hidden within the silken robes of the bridal party was a leather bag of gold, diamonds and other jewelry, the valuable dowry of beautiful seventeen-year-old Ah Quoy. After passing Cornwall Station west of Antioch, Owl Limited swung south and headed for the Central Valley. Soon the train was barreling through Brentwood. After leaving Brentwood, things began to go terribly wrong. A steam leak smothered the Owl's boiler fire. The train slowed and finally slid to a stop as it neared Byron. The stalled Owl was 20 minutes behind schedule. Now less than ten minutes behind the Owl, the Stockton Flyer was picking up speed. Dolan, the Owl's conductor, sent brakemen Austin and Cole up the tracks to signal the oncoming Flyer with a red lantern. There was no sense of urgency on the Owl since the conductor believed that he had plenty of time before the Flyer arrived. Creditable witnesses stated that Brakeman Cole walked only about 200 feet north of the Owl Limited when the lights of the fast moving Stockton Flyer were seen. The Flyer's engineer McGuire saw in the distance numerous white lights of the Owl's passenger cars but no red warning light. He assumed the Owl was sitting safely in the Byron siding. Then less than 1000 feet from the stalled Owl Limited, McGuire saw the red warning light. The heavy locomotive was estimated as moving around 60 miles per hour. The passengers on the Owl were in a holiday mood. In the packed rear car the travelers joked about the legendary slowness of the Owl. The last thing many of the passengers in the rear car of the Owl Limited heard was a desperate warning blast from the oncoming Flyer and the shriek of air brakes, the scream of steel against steel. Survivors reported that the Flyer's giant locomotive slashed into the rear passenger car like "a gigantic sword driven by the arm of a monster." The rear car was crushed like a giant accordion. The Stockton Flyer then continued to drive another six feet into the diner car badly burning the cooks. After the grinding crash, there was a moment of stunned silence. Until the moans and screams began the only sound was the hiss of escaping steam. Massed in front of the locomotive was a pile of timbers, twisted metal and scalded flesh. Trainmen from the Flyer immediately began the grim task of chopping the survivors free with axes. Nine of the first ten dead cut out of the wreckage were crushed beyond recognition. The resort at nearby Byron Hot Springs was quickly turned into a hospital. Dr. Bird and several medically trained resort guests tended to the injured. The Byron Hotel was also converted into a temporary hospital. The people of Byron rushed to help and comfort the survivors. There was confusion mixed with horror as volunteers pulled people out of the wreckage and lit warming fires along the tracks. As best they could, the citizens of Byron tended to the dying. Eventually an emergency train arrived from Oakland. Their crew of rescue workers immediately went into action. The most seriously hurt were loaded onto the train and rushed to the Southern Pacific hospital in San Francisco. Ordinary people showed great heroism. One passenger, James Carroll, although terribly injured himself, courageously assisted other victims. He died ten days later in Sacramento but was honored for his courage and compassion by the other train survivors who sent floral tributes. Fortunately Contra Costa Sheriff, R.R. Veale, was on the Stockton Flyer. Not all who rushed to the scene of the disaster were noble or kind. The sheriff had to organize men from the Flyer to stop the looting of bodies. Until order was restored even Dr. Bird had his overcoat stolen while he was helping the injured. Twenty-eight people died. The entire Chinese wedding party was killed. Henry Curry, Contra Costa Coroner, brought twelve bodies to a temporary morgue in Martinez. Other bodies were brought to Oakland. Flags flew at half-mast in Fresno, home of many of the dead and injured. Various inquiries generally concluded that both trains were running under accepted operating rules but failed to exercise the care that even the flawed rules allowed. Many juries also predicted that similar accidents would occur in the future unless the train signaling and equipment maintenance rules were changed and enforced upon the railroads. Nevertheless scapegoats were needed. The Stockton Flyer's engineer, McGuire and the Owl's brakeman, Cole, lost their jobs. The Contra Costa coroner, Henry Curry, was later accused of stealing valuables from the dead passengers. Ella Sessions testified that her husband had over $400 when he boarded the Owl Limited in Oakland. Henry Curry claimed to have found only some cigarette paper, an old knife, a nickel, piece of watch chain and a nickel watch on the battered body. Public suspicions grew when it was revealed that in 15 years as a coroner, Henry Curry had never contributed a single dime to the county's "Deceased Fund" with moneys recovered from dead bodies. Curry never held elective office again. 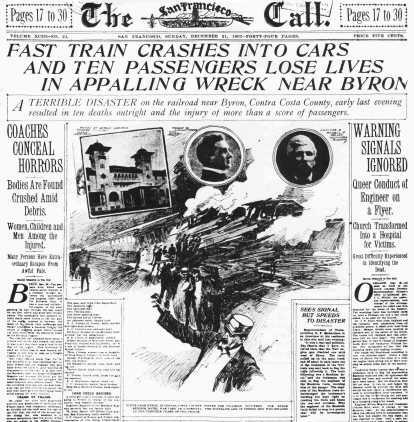 The Byron disaster and other train crashes caused the passage in 1903 and 1910 of amendments to the Safety Appliances Act of 1893. Bills were passed in 1907 and 1911 that improved workers safety and train maintenance. New automatic train control and other safety devices were established under the Transportation Act of 1920. Once a common occurrence the Byron type tragedy would finally become a rare event on American railroads. Mollenkopf, Jacquelyn, Winter 1983, The Byron Rail Disaster, California History, vol. LXI, no. 4. Rego, Nilda, 2/14/1993, "Byron Train Crash Moved State to Improve Rail Safety," in Days Gone By, Contra Costa Times. Stockton Independent, 12/21/1902, p. 1.